Mobile Computer Repairs Wonthaggi, Serving Inverloch, Korumburra, Leongatha, Kongwak, Bass, Woolamai, Grantville, Cowes, San Remo, Cape Paterson, Phillip Island,Venus Bay, Foster the Bass Coast & Surrounds. Services we provide include: Virus Removal, Laptop Screen Replacement, Computer Upgrades, Data Recovery, Internet Connection issues, Laptop & Tablet repairs, Computer Tuition and more! Whatever the computer problem, We Come to You, no need to be unplugging all those cables. We'll be there are the agreed time or we'll call you in good time if we are delayed. We have been in business for over 12 years Designing Websites and providing Computer Repairs. We have the experience and expertise to get the job done right first time. As a small business we also know how important word of mouth is and we have built a reputation for quick, professional, friendly service we continually aim to build on. 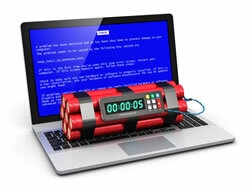 Virus & Spyware Removal - Malware, Spyware, Viruses, Trojans, Ransomware, you name it we fix it. Data Recovery - Computer won't start? there's a very good chance even if we can't get it going that we can recover your data. Computer Tuition - Fancy making a start on computers, iPads, laptops, word processing, email or Facebook, we can help! Laptop Screen Replacement - If you've cracked your screen, it's not the end of your laptop. Screens are easily replaced. Laptop Keyboards - Missing keys or maybe you've spilt something on the keyboard - we can fix it for you. Internet Connection Issues - Patchy wireless signal, drop outs, let us check it out. Email Problems - Can't send or receive email? too much unwanted (spam) email? or maybe you'd like a custom email address linked to your business? Computer Upgrades - Larger Hard Drives, Increased Memory, Power Supplies, Software Updates we do it all. Computer Installation - Bought a new computer? We can get it all set up for you, connect to your internet, install updates and Anti-virus software. Computer Running Slowly - Fedup waiting for your computer to do something? We can whip it back into shape then show you how to keep it that way.